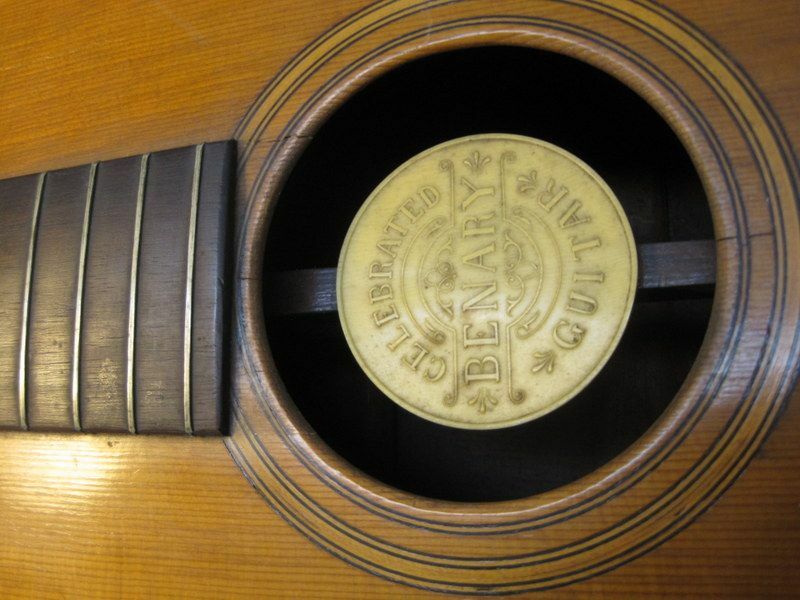 I have been asked to look over a lovely little Benary parlor guitar built circa 1886. 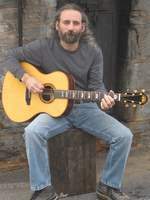 Apparently the other name associated with this style guitar is Tilton - I believe that Benary licensed the construction from Tilton (if anyone has good information I would appreciate it). Anyway the guitar does need a neck reset and I'm trying to decide whether I want to take it on or not. It has a neck stick, very much like a banjo, running just below the top from the neck heel to the tail end of the guitar. I cannot see how the stick is attached and whether it is shimmed. I'm familiar with neck sticks in both banjos and resonators but this also looks like the neck heel is glued into the head block - it doesn't make sense that the guitar would have a dovetail plus the stick (I don't think). I can provide pictures but they won't show any details of the neck or the stick. Any information would be appreciated. The guitar is playable in the first positions and I'm not crazy about diving into something this old that I don't understand. pictures would still be appreciated by anyone that wants to help I'm sure. My first guess would be that under that very funky tailpiece there is a screw or bolt into the end of the neck stick. If so I'd loosen/remove that and see if moving the stick changes the geometry - I reckon it will. If that works, you then have to decide how to reattach the end of the neck stick (if it's screwed). I suggest trying to get pictures of the inside, to see what you have at the tail end. It looks like you could get a phone in there and take pictures using flash. It is really hard to see much inside the instrument - not only the small size but that darn stick is in the way. However poking around with an inspection mirror and flash light it looks like the stick is let in to both the head and tail blocks. There are three ladder braces on the top - one under the bridge and one ahead and behind the bridge. The neck stick is contacting the first and third brace, not the one under the bridge. Reading about the Tilton design apparently they had patented something about this neck stick and it was part of their "sound". I'm thinking that it has less to do with setting the neck geometry and more with some sort of bracing effect. 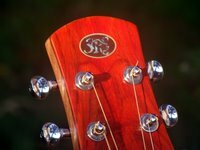 The guitar has a fairly significant concave top - maybe they were trying to counter the downward component of the bridge - the fact that it has a tailpiece means the top is acting more like an archtop with the vertical component. If that speculation is true it might just have a simple dovetail with this brace between the end blocks. However until I know more I not going to risk trying to get the neck off. 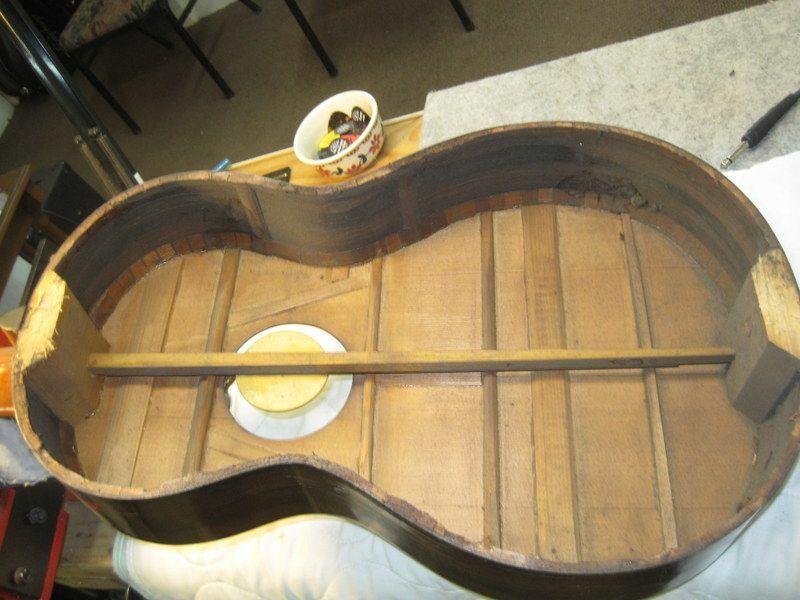 It might be worth taking the fingerboard off to see if you can get an idea of how the neck joinery is laid out. Once you know that you could create a plan that includes addressing the stick. That's what I was thinking. Just a brace but it also allows for the attachment of the plate - maybe they advertised it as a "Virzi plate" or Tone plate to differentiate their guitars from others. I'm not going to do anything invasive until I know exactly what I'm dealing with. The idea isn't to make this a player but rather to preserve a really charming little instrument. Did you see the action with strings on it? That neck set is about right for a classical guitar, which would of been the norm during that time period. When it came to me it had a new set of nylon strings (with beads and balls to make them work with the tailpiece). The action was in excess of 0.150 (4mm) at the 12th fret. This is another question that I need to resolve for the owner - how to string it. It is ladder braced, has a fixed bridge with a piece of fretwire for the saddle, and has the the tailpiece. The bridge has a little raised piece behind the fretwire saddle that has holes in it - apparently to space the strings coming from the tailpiece. The break angle is very low (I didn't measure it but I would guess only a few degrees. The tuners have small metal rollers rather than big plastic ones. The nut looks like the slots were cut for strings that increase in size (the nylon high E was fairly tight in the slot). Nut width is 1-3/4, I didn't measure the bridge. Brian, you rock. That is exactly what I have. So the "stick" is really a brace between the head and tail blocks which makes total sense with the tailpiece. I've repaired several cracks but was able to do it thru the sound hole (even with that darn stick in the way). I'll also discuss with the owner whether he wants to worry about the neck angle and which strings to put on it. Glad to help. I notice the celluloid tailpiece on yours is deformed as well. This is common and it looks as if the one in the reverb listing has a reproduction. My client opted to use a metal replacement tailpiece and keep the original in the case as we could not find a repro. I had a strategy to repair and reinforce the original with a small section of brass tubing cut in half inside to support the ball ends. Thank you again, Brian. Here is the rest of the story. I closed and cleated the largest crack, worked a little HHG into some other small ones and one on the neck heel (which had been worrying me if I had to do a reset), did some minor cleaning without removing any of the wonderful patina. Restrung with the nylon strings that were on it and met with the owner. Told him the action was fine in the first position but pretty high as we moved up the neck - its certainly playable and he agreed to take it as it is.